The following is a two-part story contributed by Don Smurthwaite, Communications Specialist for the Bureau of Land Management. Already read part I? Jump to part II here. Glen Burkhardt points to a scrawny Russian Olive tree near a gravel road somewhere in the desert of southwestern Idaho. “The only tree in the Jarbidge,” he deadpans. And a quick look around the vista confirms he may be right. More brown than green, beat-up and a bit bent-over, it’s the only tree as far as the eye can see. The Jarbidge country, roughly sixty miles southeast of Boise, is a tough place. Triple digit temperatures in the summer, single digits and lower in the winter, with annual precipitation that only amounts to four inches in some locations, make it a difficult place for much to thrive. But in a place too extreme even for some cactus species, the Jarbidge country – along with much of the rest of the Great Basin – is a near-perfect incubator for cheatgrass, the infamous invader from the Eurasian steppe that dominates an estimated 70 million acres in the West. You may know the basics of cheatgrass. They read a bit like a most-wanted poster for an outlaw. It’s aggressive. It’s a prolific seeder, with a single stalk (and there can be as many as 10,000 stalks in a square meter) capable of producing 300 seeds. It has little nutritional value for wildlife or livestock when cured and dried. It has a shallow root system and “competes for every drop of water out there,” says Burkhardt. It cures earlier than perennial and native vegetation. Its flammability is often compared to tissue paper. It clumps into a thatch that makes wildfires difficult to put out. And it stays put in the soil a long time. “You know how that stuff wiggles its way into your socks? It does the same thing in the soil,” Burkhardt says. And worst of all, it pushes out native vegetation and sets in motion what land managers, ranchers, firefighters and those who live and play in the Great Basin call the fire-and-invasive species cycle. There is no single solution to the invasive species problem in the Great Basin. There may never be a solution, period. Fire managers, ecologists and researchers generally talk about limiting the damage, picking their spots to push back, saving as much of the remaining native habitat as they can. The most promising approach is establishing fuel breaks. The concept is to break up or fragment continuous fuel beds by reducing vegetation in key places and replacing it with plants more resistant to wildfire. When a wildfire burns into the fuel break, the flame length decreases and its progress slows, allowing firefighters to get a handle on the blaze. And fuel breaks make the job of firefighters safer, too. It’s a fuel break that brings Burkhardt and Sisneros to the Jarbidge on this hot July day. They’re looking at a long, angular fuel break near the U.S. Air Force’s Saylor Creek Training Range and stretches farther to the east before doubling back toward the west. Stop One is just east of the training range. Burkhardt and Cisneros hop out of their truck and walk up a slight slope where a fuel break was established two years before. To the south, the Jarbidge Mountains, a wisp of snow on their northern face, already shimmer in the morning heat. Sisneros, head down, inspects the fuel break. He seems discouraged. Russian thistle and tumble mustard, two undesirable plants, cover the site. He walks farther into the fuel break and his mood brightens. Siberian wheatgrass is flourishing. Forage kochia taking root. There’s good spacing among the plants, making it difficult for a fire to carry. The plants aren’t large, another plus. Less fuel. The root wads seem a good size, meaning the vegetation is healthy and will have staying power. And even in the baking July heat, the plants are green. “Better. This is good,” Sisneros says. In the Jarbidge, the ideal design for fuel breaks is 275 feet on either side of the road. Burkhardt, who has degrees in wildlife and range management from Arizona State University, says it’s important to recognize that fuel breaks are constructed along existing roads, helping to maximize habitat continuity by not carving them out of untouched ground. “The roads are already there. You’ve got the basis for fuel breaks in place. If we want to get this country restored, it’s where we’re going to have to start,” he says. It’s back to the truck and on to another segment of the fuel break, several miles to the east over dusty, gravelly road. At an intersection (“Crows Nest, 10 miles; Clover Crossing, 17 miles; Highway 78, 36 miles”), Sisneros and Burkhardt walk into the fuel break and take a close-up look. Beyond the fuel break, the land is a place of stark contrast. To the northeast, a flat area and small ridge are shrouded in cheatgrass. A mile to the south, a healthy stand of sagebrush stands out, dusky green against a dun backdrop. The dissimilarity is not lost upon Burkhardt. “You’ve got a choice,” he says. “You can block up the country some and establish fuel breaks and lose some acres or you can do nothing and lose it all. It can look like this,” he continues, motioning toward the healthy sagebrush, “or it can look like that,” as he turns and nods toward the near-monoculture of cheatgrass. Looking again toward the swath of cheatgrass, Burkhardt talks more of cheatgrass’ insidious characteristics. “Cheatgrass forms a nice mat, especially when it’s been under snow much of the winter. When you put water on it or drop retardant, it doesn’t penetrate well. You think the fire is out and move on, then it rekindles or burns across the line or under the other fuels. All of that ensures future generations of cheatgrass. “Fuel breaks give firefighters a snowball’s chance to get hold of a fire, plus it makes their work safer,” he says. First, remove the existing vegetation, primarily cheatgrass and crested wheatgrass, with herbicides. Sometimes, the site is mowed before chemical application. Next, drill seed into the ground with a “stabilizer” species, such as Siberian wheatgrass, which can outcompete cheatgrass. Forbs (flowering, non-grass, sedge or rush plants) such as yarrow or globemallow may be part of the mix. Next, aerial seeding usually takes place, in the Jarbidge, generally forage kochia, a plant with seeds the size of a pepper grain. And after that, maintenance, which may include any of the above steps, and last several years. Eventually, the brown, barren fuel break turns into strips of green, well-suited to keep wildfires in check. Fuel breaks, especially in the early stages, are not pretty to look at. It’s an irony of restoration work, but in the early stages, untreated vegetation beyond a fuel break often looks greener and healthier for much of the year. He looks at the fuel break as the truck bumps down the road. He can see ahead, can see the beauty in the beast, see the time when the fuel break is established, looking better and tamping down wildfire. But that time may be years ahead. For now, it’s two strips of brownish-gray fallow ground. A single sunflower stock rises against a backdrop of Russian thistle, cheatgrass and other invasive species. Having it both ways is the quandary that wildlife biologists face. Fuel breaks fragment habitat, even when they’re constructed alongside existing roads. Some sagebrush-steppe vegetation is lost when a fuel break is established. Paul Makela is a BLM wildlife biologist and program lead in Boise who has almost 30 years of sage-grouse experience. He works closely with Burkhardt and acknowledges there is a scarcity of research on optimal designs for fuel breaks relative to wildlife. He also recognizes trade-offs. For him, the questions regarding fuel breaks come down to balancing an equation. What are the benefits? What are the drawbacks? And importantly, how do the local, more site-specific impacts of fuel breaks on wildlife or wildlife habitat compare with the broader benefits of proactively managing a fire-prone landscape? When does one need outweigh the other? The Centennial Fire of 2017 was projected to burn 142,000 acres. After burning into the fuel break pictured above and to the left, it was controlled at 18,660 acres. It’s the final stop of the day, a place where only a year earlier, the Centennial Fire burned. That fire might be the poster child in southern Idaho for fuel break effectiveness. A lightning-caused wildfire erupted in the midst of high temperatures, low relative humidity and strong wind, in an area with plenty of fuel. It was the perfect recipe for a damaging, if not devastating, fire. Models projected the fire growth at 142,000 acres. Then, the Centennial Fire burned into the fuel break. And the white-knuckle situation changed almost instantly. A fire that burned more than six miles in 90 minutes laid down and became manageable. “The head of the fire almost fell over. It became a flanking fire,” Stephens remembers. Firefighters quickly got the upper hand on the blaze. When it was controlled the Centennial Fire burned only 18,660 acres. Back in the truck, again bouncing down the narrow gravel road. Overall, Sisneros and Burkhardt seem satisfied with what they’ve seen on their trip to the desert. At the Centennial Fire site, the fuel break looks good. “If we could get this result along the whole fuel break, it would be a big win for us. This area would be difficult to burn. Very difficult,” Sisneros says. But it’s a huge task. The country is vast. Thousands of miles of fuel breaks are needed in southern Idaho alone. The sagebrush-steppe burns so easily, due to “lightning and stupid-human tricks,” Burkhardt says amiably. Cheatgrass and other invasives – some, such as medusahead, even more pernicious than bromus tectorum – are relentless. So far, only about 173 miles covering 5,426 acres have been treated in the 1.4 million acre Jarbidge Resource Area. Working with a variety of partners as diverse as ranchers, conservationists and the U.S. Air Force provides its own set of opportunities and complexities. With so much work ahead, against formidable odds, does the prospect ever feel overwhelming? Sisneros thinks about the simple question, then gives a simple answer. But there is a purpose to it all, a meaning, a cause, difficult as restoring sagebrush-steppe may be. 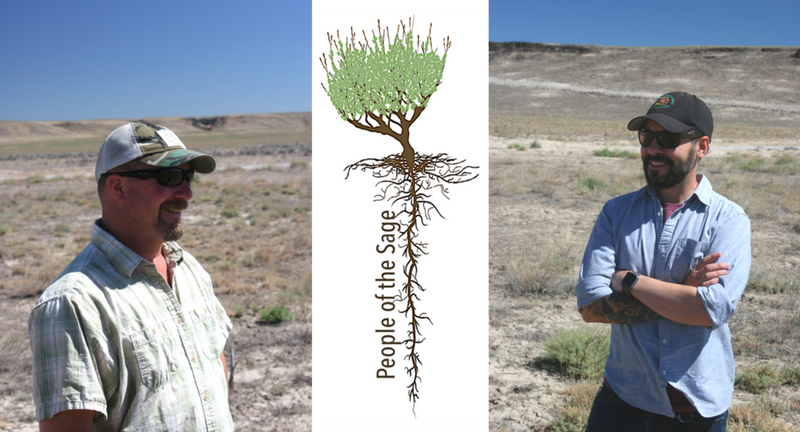 And it appeals to people such as Sisneros and Burkhardt, who are spending much of their professional lives in the sagebrush-steppe, trying to overcome the vexing problems of the wildfire-and-invasive species cycle. “It’s our only option,” Burkhardt says. And there are signs of success. The Centennial Fire, certainly. Other fires in the area that have been slowed by the strips of fire-resistant vegetation. Progress on establishing the fuel break network, gradually transforming from bare, brown ground to patches of green. A slow but steady increase in public awareness about the wildfire and invasive species cycle, and successful partnerships. The learning that leads to better design next time. And a very good moment a few weeks before, when Sisneros spotted five sage-grouse hens scampering across a gravel road, in a place where he didn’t think any of the birds existed. Go back to the Russian olive, the only tree in a big stretch of the Jarbidge country. It’s tougher for the wear and tear that a harsh environment inflicts, but the point is, it’s still there, still alive, pushing back against the odds. It’s a survivor. “The Jarbidge is the place where all this needs to start getting fixed,” Sisneros says. The Progressive Rancher Magazine Features This Partnership!